This article is about the book. For the Rich Dad brand, see Rich Dad. Rich Dad Poor Dad is a 1997 book written by Robert Kiyosaki and Sharon Lechter. It advocates the importance of financial literacy (financial education), financial independence and building wealth through investing in assets, real estate investing, starting and owning businesses, as well as increasing one's financial intelligence (financial IQ) to improve one's business and financial aptitude. 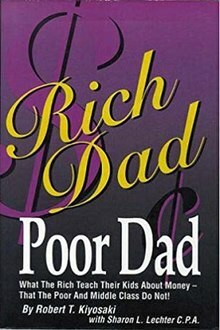 Rich Dad Poor Dad is written in the style of a set of parables, ostensibly based on Kiyosaki's life. Rich Dad Poor Dad has sold over 32 million copies in more than 51 languages across more than 109 countries, been on the New York Times bestsellers list for over six years, and received positive reviews from some critics. American talk show host and media mogul Oprah Winfrey endorsed the book on her show. Another celebrity supporter is actor Will Smith, who said he is teaching his son about financial responsibility by reading the book. PBS Public Television station KOCE, aired a 55-minute presentation of Robert Kiyosaki titled "A Guide to Wealth" in 2006 which essentially summarises his Rich Dad Poor Dad book, and which is now available on YouTube. PBS also honoured Robert Kiyosaki with an excellence in education award in 2005. Donald Trump did a literary collaboration with Kiyosaki in 2006 called Why We Want You To Be Rich, Two Men One Message and a second book called Midas Touch: Why Some Entrepreneurs Get Rich — And Why Most Don't in 2011. American fashion entrepreneur and investor Daymond John has called the book one of his favorites. American rapper Big K.R.I.T. made a song called "Rich Dad Poor Dad" though it had no connection to the book. John T. Reed, a critic of Robert Kiyosaki, says, "Rich Dad, Poor Dad contains much wrong advice, much bad advice, some dangerous advice, and virtually no good advice." He also states, "Rich Dad, Poor Dad is one of the dumbest financial advice books I have ever read. It contains many factual errors and numerous extremely unlikely accounts of events that supposedly occurred." Kiyosaki provided a rebuttal to some of Reed's statements. Slate reviewer Rob Walker called the book full of nonsense, and said that Kiyosaki's claims were often vague, the narrative "fablelike", and that much of the book was "self-help boilerplate", noting the predictable common features of such books were present in Rich Dad, Poor Dad. He also criticizes Kiyosaki's conclusions about Americans, American culture, and Kiyosaki's methods. The book was originally self-published in 1997 before being picked up commercially to become a New York Times bestseller. It has since sold over 32 million copies and become a household name. In his audiobook Choose to be Rich, Kiyosaki said that every publisher turned him down, and Barnes & Noble refused to stock the book initially. He places his focus upon talk shows and radio show appearances, of which The Oprah Winfrey Show had the biggest influence on book sales. On April 2017 a 20th Anniversary edition of Rich Dad, Poor Dad was published and in a preface to this 20th Anniversary edition Robert T. Kiyosaki asserts that an estimated 40 million copies of the book had been sold worldwide. ^ a b Walker, Rob. "If I Were a Rich Dad" in Slate, June 20, 2002. ^ "Top Selling Personal Finance Book of All Time; Rich Dad Poor Dad NOW Available for FREE Download!". www.businesswire.com. Retrieved 2017-07-30. ^ "New York Times Best Selling Author of Rich Dad Poor Dad Robert Kiyosaki". 2016-05-06. Retrieved 2017-07-30. ^ "Rich Dad, Poor Dad Review - Revisited Ten Years Later". Investor Junkie. Retrieved 24 January 2016. ^ Will Smith on making his kids read Rich Dad Poor Dad. 24 September 2010. Retrieved 24 January 2016 – via YouTube. ^ A Guide to Wealth. 2006. Retrieved 7 December 2018 – via YouTube. ^ "PBS Honors The Rich Dad Company with Excellence In Education Award – Press Releases on CSRwire.com". www.csrwire.com. Retrieved 2017-07-30. ^ Susanna Kim (Oct 12, 2012). "'Rich Dad, Poor Dad' Author Files for Bankruptcy for His Company". ABC News. Retrieved 31 May 2014. ^ "The Making of FUBU — An Interview with Daymond John". Tim Ferriss. Retrieved 31 May 2014. ^ "Video: Big K.R.I.T. Explains the "Rich Dad Poor Dad" Video". Retrieved 31 May 2014. ^ "Spare us the finance evangelists and their false profits". John T. Reed's Blog. September 3, 2015. Retrieved 2015-09-03. ^ Robert Kiyosaki. "Robert Kiyosaki's Public Response to John T. Reed's Review of "Rich Dad Poor Dad"". Retrieved 2011-12-01. ^ "GURUSPEAK : Robert Kiyosaki". The Financial Express. Retrieved 24 January 2016. ^ Kiyosaki, Robert T. (2017). Rich Dad, Poor Dad. Plata Publishing. p. 7. ISBN 9781612680194.